When I first started to read By Wolfsbane and Mandrake Root by Melusine Draco, it was storming outside. I curled up on my couch and watched forked lightning snake across the sky as I held a mug of tea in one hand and the e-book of this in the other. The storm reminded me of the opening scene in Shakespeare’s Macbeth where the witches gather around their cauldron and summon up spirits. It seemed like the perfect night to read about poisons, and I was definitely not let down by Draco’s work. to our modern way of thinking, poisoning has always been referred to as an ‘arte’, possibly because its association can be found in the Greek word pharmakos, used to refer to herbal remedies, spell-potions, and poisons – and those who crafted them. (3). The association between our modern conception of the pharmacy — the place where we receive pills and medicine — and this prior association with poisoning and potions is still intact. In some interpretations, the drugist is curing us of our ills, but if we take too much of a certain pill — or if the drugist swaps out what seems like our cure-alls — we perish. The items that either poison us or cure us have always been held in a high regard, and because of that, have often been associated with witchcraft. Draco’s work explores this connection through a series of stories in each of her chapters, introducing solidified historical records, literary examples, or folkloric tales. It is not a how-to of poisons, but a (perhaps) nostalgic look back on the stories of poison and spellwork. When she surveys literature and myth for sources of some of the greatest murders or enchantments, it’s done in service of the poison as an item of study. By establishing a lineage of the pharmakos, she traces the history of the items that make it. From the hemlock that Socrates drank to many more Shakespeare revisitings (like the ear-poison in Hamlet, thought to be henbane), her tracking of references, and the explanation behind each one, was quite possibly my favourite part of this entire book. Each incident was familiar to me — many students had to read Plato’s The Apology in their high school class and know Socrates’ speech before death — but it was also unfamiliar since, as is its point, the poison itself is not remembered. Poison is a tool, and in many of these case studies, it works by being invisible. The same goes for spells and enchantments; to work magic is to make sure that no one sees this magical item. So to have Draco highlight all these scenes and direct me to the magic behind them gave me a secret thrill. That’s also the point of a book on poisons, right? The thrill in the knowledge that you hold can possibly cure or kill? The Greek pharmakos hints to this thrill as well, since pharmakon in the Greek language translates to both poison and medicine. Knowing the plant life that can cure and the plant life that can kill is important for survival, and those who hold that knowledge are in the most amount of power. Yet, those who know the most about these items are often ignored in many other historical accounts: women, mystics, healers, shamans, midwives, and of course — witches, themselves. Though this book spends a lot of time focusing on witchcraft and spellwork, it does not always have its anchor there. In many ways, it reminds me of Barbara Ehrenreich and Deirdre English’s Witches, Midwives, and Nurses – A History of Women Healers since it illuminates a secret history for those who may not have been aware, and by sheer virtue of the history being secret, the text itself feels magical. Draco has done her homework here, either through her methods of gathering and testing or through common book research (the bibliography is quite impressive). While she encourages people to explore for themselves, she’s also highly cognizant of the danger in this work. In many different places, she warns people about certain elements of plants/herbs. These warnings are not because this knowledge is forbidden; it’s for bodily caution of the person and those they may come into contact with. Draco wants the reader to take part in the secret thrill of history, literature, and magic — and that, to me, makes all the difference between writing a didactic book of how-tos vs. a historical and personal approach to something that could be dangerous, but is mostly illuminating. 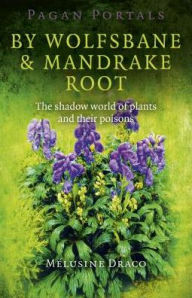 By Wolfsbane and Mandrake Root is a compact book full of information. I was shocked that it was only ninety-six pages; by the time I got to the very end, I didn’t want it to be over (especially during my favourite chapter — The Proving Tree), and I was in awe at how much Draco had managed to cram into the book. Though I longed for the work to keep going, I had a feeling that was mostly atmospheric more than anything else. Alas, good books, like enchanting thunderstorms, need to end at some point. The book reads easily, but not at the cost of information. I’m hard-pressed to say what they could have added, so even if I wanted it to go on, I can’t fault Draco for that fact, only praise her. By Wolfsbane and Mandrake Root is one of the many in a Pagan Portal series published from Moon Books, some of which include titles on The Morrigan and Kitchen Witchcraft. My experience with this book makes me want to read more in the series, and especially seek out more work by Melusine Draco. Hopefully another thunderstorm will give me the chance soon enough.